Join Lela’s Water Revolution! – Happy. Homeschooling. Housewife. Last week Lela read an article that talked about how kids are not drinking enough water. She also discovered she was one of those kids. She was so interested she even created her own water drinking survey (thanks to all that took it. If your child hasn’t taken the survey yet, click here). Ever since then she has been fired up to change and to get other kids like her to DRINK MORE WATER. 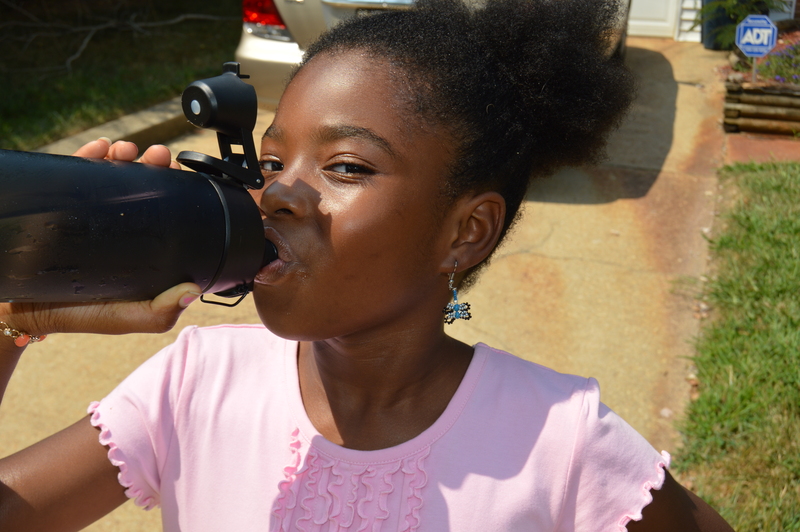 Parents, please help support Lela by letting your children watch her quick Water 4 Life video. After the video see if your child wants to take the challenge and join the revolution! Each week from now until October 4th, Lela will update you on her progress. Please be sure to send stories and pictures about your child making the right choice by choosing water. We can’t wait to share your stories and pictures with our community to help encourage kids everywhere to drink more water!!! Be sure to sign up. Week 1, Lela is going to share the results to her water survey. So if your child hasn’t completed it, do it now!! Sign up for the PLEDGE! 1. Drink 10 cups of water a day! 2. Eat lots of fruits and vegetables! 3. Don’t order sugary drinks! We promise not to email you anything else except news about this challenge! Be sure to send your healthy choice pics and stories to my mom at Channie@TripleHLife.com! !